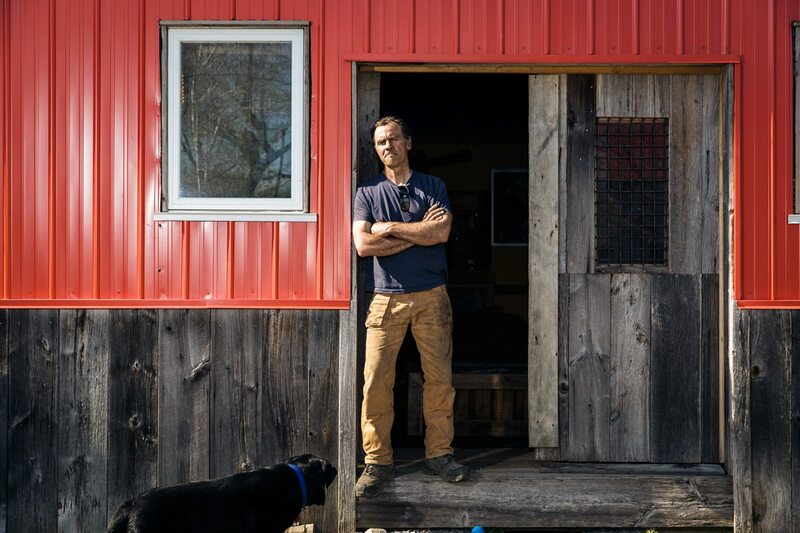 The retired City of Ottawa firefighter lives on a farm outside Kemptville, where he has transformed half of his 19th-century barn into a metalworking shop. At its heart is the coal forge, which, fired up, hits over 1,300 degrees Celsius. 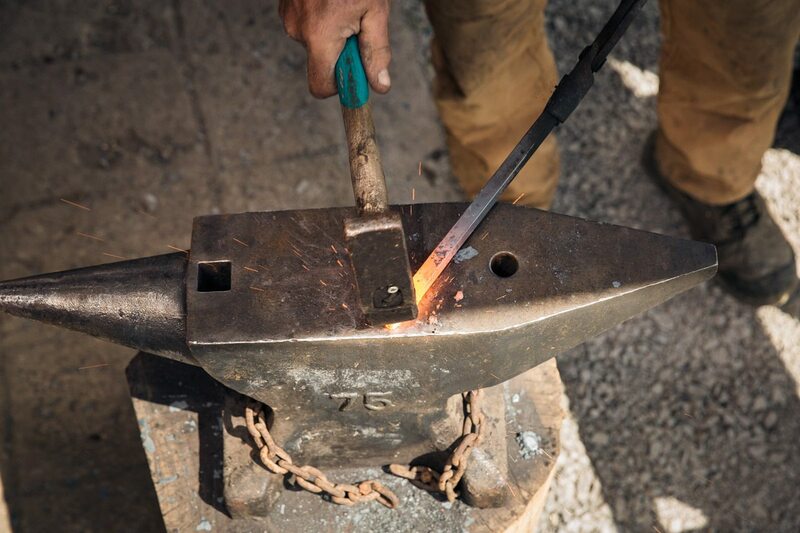 Mark Tedeschini spends uncounted hours at that forge, fashioning from scrap metal the custom furniture and ironworks that are the specialty of his business, 1215 Studios. 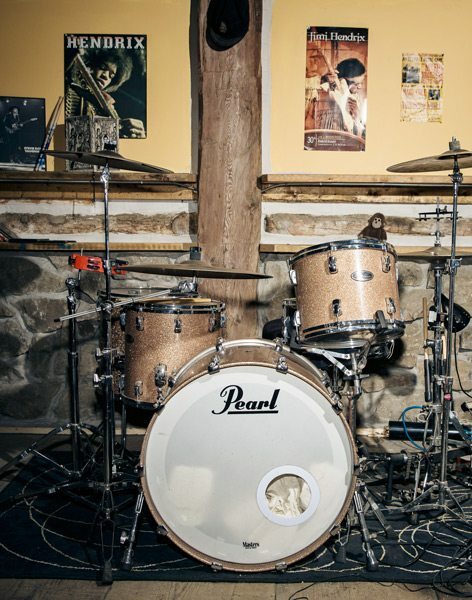 The other half of the barn is a music studio, with Tedeschini’s Pearl Reference drum set holding down centre stage. But even music leads Tedeschini back to the heat. “When I sit down to play, I get inspired to build things,” he says. Fire — or at least all those decades fighting it and witnessing its gruesome impact on people, pets, and property — has also left Tedeschini, 55, with PTSD. It’s a debilitating illness, but it’s not what he wants to talk about when we first meet. Instead, he leads the way through his shop, past tools and raw materials and hand-wrought items like whimsical stands for dog dishes, into the quiet of his music studio. Part of the music space is devoted to socializing. A couple of comfortably worn couches, end tables that were once drums, and medieval-themed wall lights he made in his shop create a laid-back vibe. 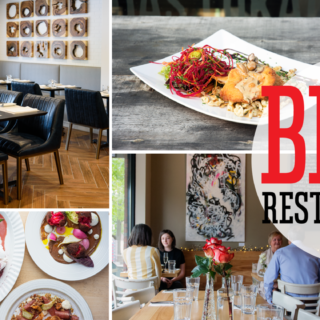 The black Labs that are Tedeschini’s housemates snooze nearby on the thick-planked floor, echoing the relaxed atmosphere. A bar hugs one wall. It’s fashioned with a footrest Tedeschini made from a chunk of railway track — “1903 Ohio Steel Company” is stamped into its side. Above the sitting area is a loft. “It was a mow full of hay when I saw the barn the first time,” he says. And while the building he moved into in 2010 was decrepit — a tree grew through one part of its roof — Tedeschini immediately spotted its potential as the music studio he’d long wanted. 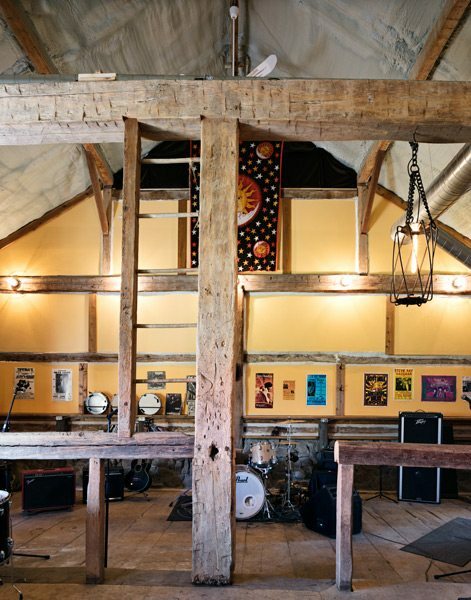 He envisioned a version of Levon Helm’s studios in Woodstock, N.Y., where the late Helm, former drummer for The Band, once hosted his legendary Midnight Rambles music sessions. “I came in, looked around, and I said, ‘I don’t care what the house looks like — it’s the barn I want!’ ” he recalls. He bought the property and, with help from his dad, began restoring the barn. While reconstructing the building, Tedeschini wrote to Helm’s widow and daughter to let them know he was “doing a small version” of the Woodstock studio. 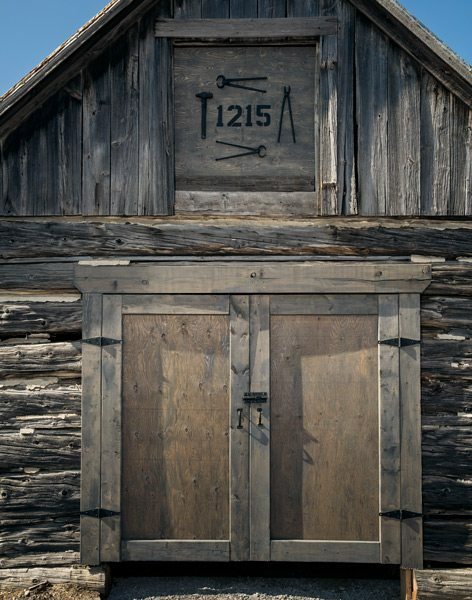 “They were really thrilled.” The result of Tedeschini’s labour is a welcoming, functional space that honours its origins: for example, the old marks of an adze are clearly visible on the barn’s hand-hewn beams, and Tedeschini used stones from the surrounding land for interior masonry work. The area set aside for music-making is intimate and unprepossessing. 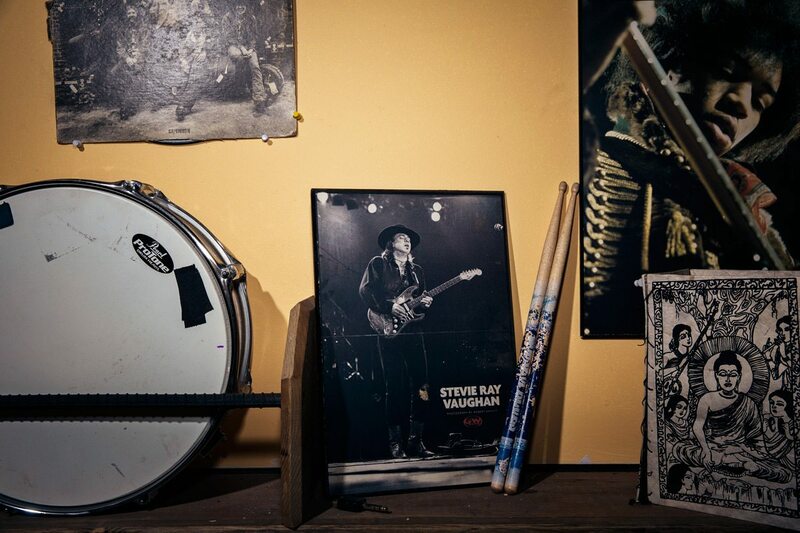 Posters of Stevie Ray Vaughan point to Tedeschini’s fondness for blues-rock, while his DVD collection includes The Last Waltz, the famous recording of The Band’s final concert, and Jimi Plays Berkeley, a terrific Hendrix concert documentary from 1970. On a nearby shelf rest a couple of century-old military bugles and caps. Tedeschini, in the eager manner of one who spends too little time with others, explains that the caps and bugles once belonged to his grandfather, who emigrated from Italy to Alberta, where he headed up a part-time marching band. 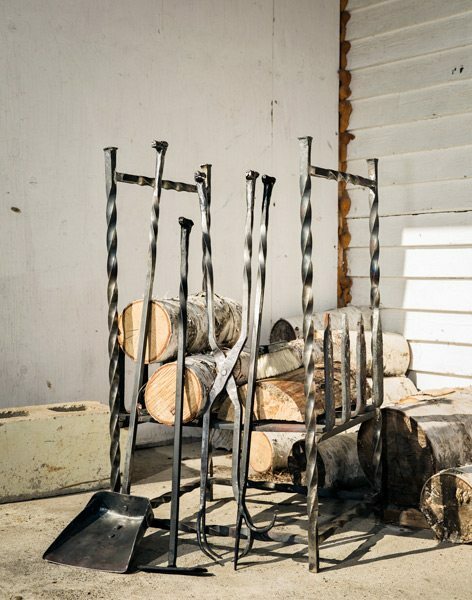 A self-taught metalworker (“YouTube is a real good resource”), he uses his shop to make lovely objects, including fireplace sets, a towel rack (fashioned from an old farm implement), and more. 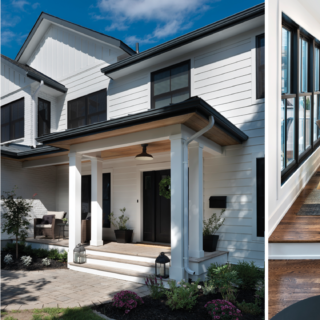 The custom furniture is built in collaboration with area woodworking businesses Logs to Lumber and Heritage Mantles. Scrapyards are his favourite hunting ground for raw material like the old car springs and bits of farming equipment that pepper his inventory. “I like the old, pitted stuff — you get a nice patina when it’s shined up,” says Tedeschini. “The guys at the junkyard say, ‘What do you want that piece of crap for?’ It’s because it has character and a story behind it. 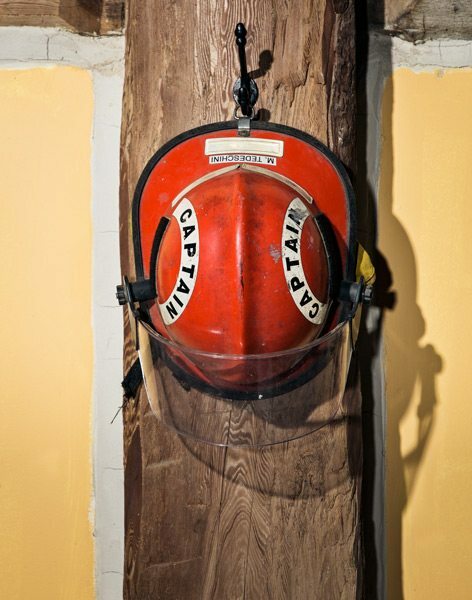 But firefighting can exact a toll on anyone, and in 2002, Tedeschini was diagnosed with PTSD. Tedeschini did continue working (“My therapist got me through the last eight years”) and retired after 30 years of service in 2012 with the rank of captain. Now some days are good, others rougher. And so he works. 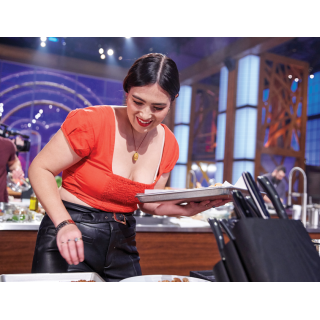 “When I play the drums or work the forge, my mind goes blank. Otherwise, my brain’s a Rolodex of things I saw,” he says. But he’s quick to add that he’s not courting sympathy and that he wants fellow PTSD sufferers or those who care about them to know that something positive can still emerge.